The tall and blonde pivot have left KIF Vejen and now goes to a better team, in Svalastog Spellerberg’s opinion, FC Midtjylland. There is no doubt that FC Midtjylland has a stronger and more experienced team than her former club KIF Vejen. Now Louise Svalastog Spellerberg will join four other national team players in her team and raise her chances for a more regular place in the national team. – I got huge ambitions and want to win trophies, that’s why I change to FC Midtjylland. It’s an excisting project and a good team I will be a part of. I look forward to co-operate with Susan Thorsgaard on the line, Louise Svalastog Spellerberg, that recently have been to camp with the national team, comments. The soon to be 31 year old Louise Svalastog Spellerberg with 19 national team matches wants to add more to that number. With both world championship and olympics ahead, she’s aiming to be a part of the national team at both events. -I want to be a regular at the national team, and my goal is to be a part of the team in both world championship in Brazil and London Olympics. Now I’ve come to a club with four established national team players. I believe that working with them will enforce my possibillities to get an established national team player. And, I will be a better player by playing in the top of the league and in Champions League where I will meet the best of the best. It’s not the first time Svalastog Spellerberg plays in the club. Back in the 2007/2008 season she played for Ikast (now FC Midtjylland after a change of name couple of seasons ago) and are not that unknown with the club and city. Noe Louise Svalastog Spellerberg and rest of the FC Midtjylland team are in Germany playing a tournament where they meet Leipzig and Trier among others. 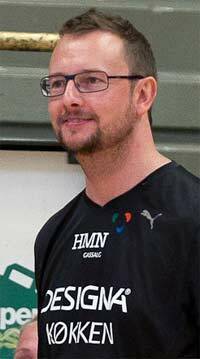 Bjørn Kenneth Muggerud, CEO of Goldfish Media, chief editor for timeoutmag.com, handballreferee & handballcoach since 1990.